Liven up Easter Sunday with some tasty Easter Egg Jell-) Shots. We're not suggesting you should pass them out at church, but it sure makes for a fun, adult Easter egg hunt once you get home for brunch. Choose your favorite spirit, preferred gelatin flavor, and mix up the best batch of wobbly cocktails your grandmother has ever tasted. Mix all three ingredients together, then let the liquid sit for about 15 minutes. 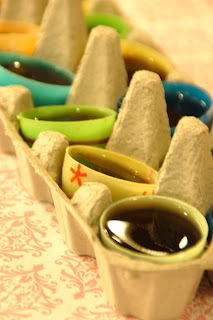 Pour into plastic Easter eggs (be sure to choose eggs without a tiny hole on the end!) and chill in the fridge for 6-8 hours.